Stokesley 2nd XI v Newton Aycliffe 1st XI – weather was hot and sunny. Stokesley won the toss and chose to bowl first. Newton Aycliffe 1st team had a disastrous day losing away at previously winless and bottom of the table Stokesley 2nd XI by three wickets. The bright spot of the day however was the performance of all-rounder Michael Howe (sponsored by Yvonne and Bob Wood, pictured above), who was given the man-of-the-match award after top scoring with a superb innings of 79, from 64 balls faced and included ten boundaries and a six. Michael then followed this up with the ball taking 2 for 25 from 13 overs during the home sides successful run chase. This defeat to bottom of the table Stokesley is a bitter blow for Aycliffe first team’s promotion aspirations, but they still sit in third place in the table with 204 points from 13 games played and host second-top Sedgefield in a crucial game this Saturday. 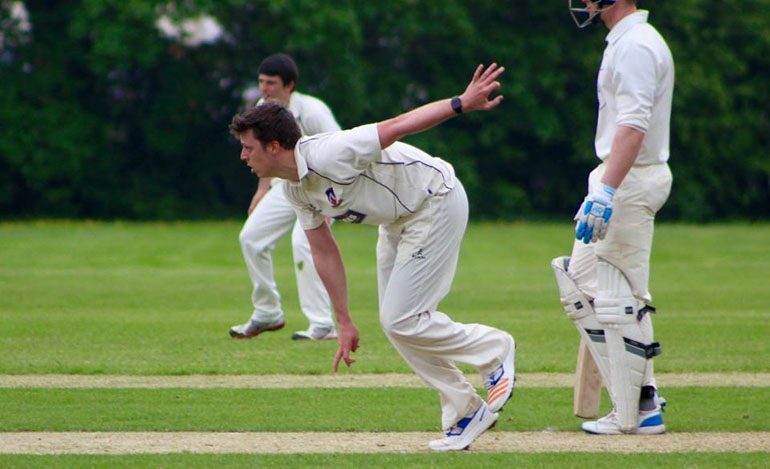 Newton Aycliffe 2nd XI v Sedgefield 2nd XI – weather was hot and sunny. Newton Aycliffe won the toss and chose to bat first. Neil Bancroft 4 for 36, Lewis Gimple (2 for 20) and Dan Weldon (2 for 42). Aycliffe’s young second team put in a splendid performance and were desperately unlucky to lose at home to third in the table Sedgefield 2nd team by just two wickets. Dan Craggs was awarded the man of the match for an excellent innings after top scoring with 37 runs from just 40 balls faced and he hit eight boundaries.